The 2018 Audi A1 Sportback is a premium rival to the MINI Hatch and DS 3, as well as upmarket Vignale versions of the Ford Fiesta in the supermini hatchback class. But it is also closely related to the Volkswagen Polo and SEAT Ibiza – the three cars are all based on the same underpinnings. How many doors does the 2018 Audi A1 Sportback have? This second-generation model is available only as a five-door version, known as a Sportback in Audispeak, and is 56mm longer than its predecessor, at 4,029mm long in total, though slightly narrower and lower. Inside, it feels noticeably larger than before, both in length and – perhaps oddly given the slightly narrower footprint – width. 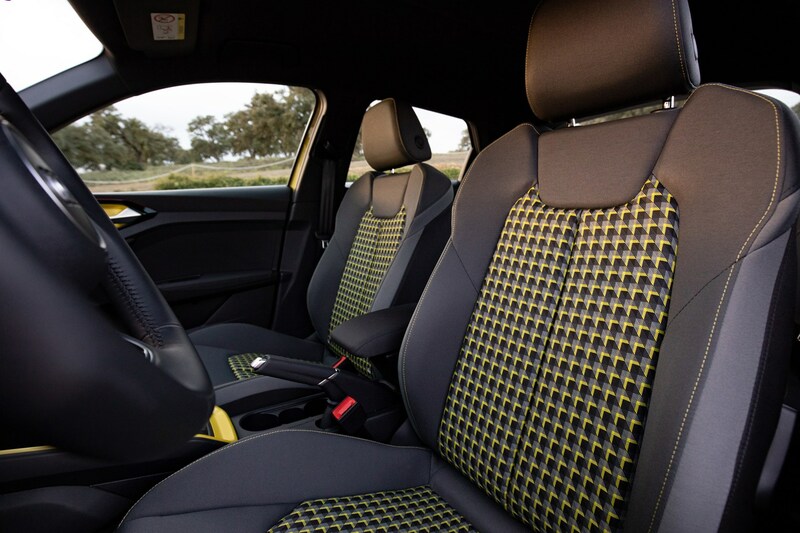 Audi’s own figures back this up, with claims of 43mm extra shoulder room and 28mm of additional elbow room. Four six-feet adults have just enough room to travel in comfort, and there’s a larger boot, too – 335 litres of space with the seats up, and 1,090 litres with them folded. That represents useful increases of 65 and 170 litres respectively. The 3,982mm long five-door MINI Hatch has 278/941 litres of luggage room in comparison. A standard 8.8-inch touchscreen infotainment system and 10.25-inch digital instrument cluster lend a slick, modern feel, with the high-tech gloss complemented by crisp, architectural lines of the dashboard. The trade-off is some hard, cheap-feeling interior plastics in surprisingly noticeable places – the top of the doors, for instance. However, physical buttons are logically arranged, and the touchscreen intuitive to navigate. 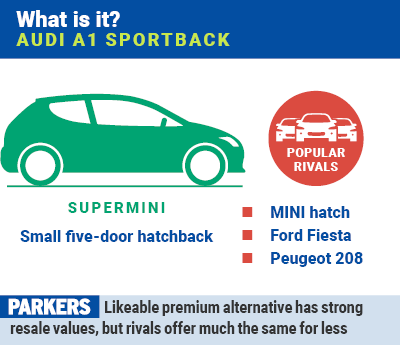 Which engines does the 2018 Audi A1 Sportback have? There are four turbocharged petrol engines available, if no diesels. The 1.0-litre three-cylinder engine comes in either 25 TFSI (95hp), or 30 TFSI (115hp) states of tune. There’s also a 1.5-litre four-cylinder 35 TFSI with 150hp, and the range-topping 40 TFSI, a 2.0-litre four-cylinder boasting 200hp. 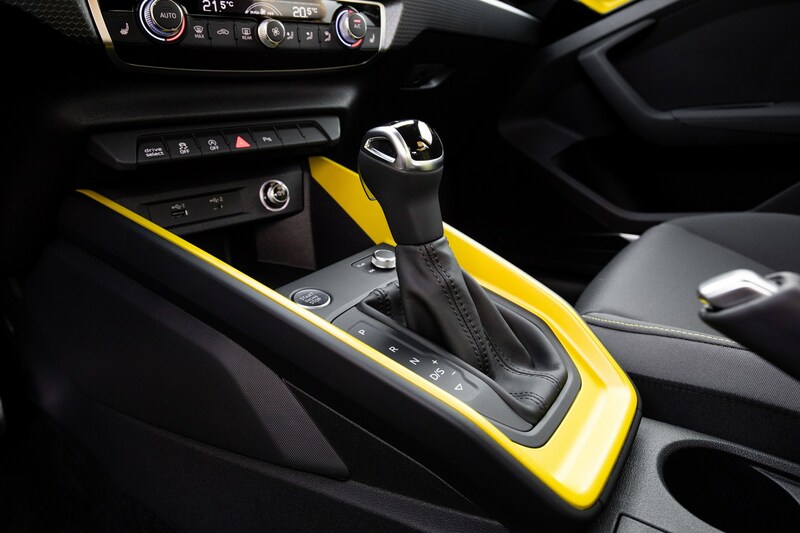 A choice of six-speed manual or dual-clutch S Tronic automatic gearboxes is also available. Not all performance and efficiency figures were available at the press launch, but the three-cylinder 30 TFSI promises an excellent 58.9mpg and 108g/km CO2 on the more stringent new WLTP test cycle. In fact, the 30 TFSI with a manual transmission is our pick of the range. The three-cylinder engine isn’t particularly exciting, but there’s still plenty of performance for everything from urban to motorway driving, and there’s a likeably eager, flexible feel to the way it delivers its modest performance. The three-cylinder engine is also around 45kg lighter than a four-cylinder equivalent, which not only helps to offset some of the performance deficit, but contributes to the nimble handling. The light, easy manual gear change underlines the peppy feel – the S Tronic automatic does a fine job, but it adds weight and cost and removes a little driver involvement. Overall, this is a nicely balanced car, with enthusiastic performance, nimble handling and comfortable suspension. Somehow, progressing through the range results in diminishing returns: the 1.5-litre 35 TFSI is more powerful, but its performance is delivered in a rather flat, monotone manner. The range-topping 40 TFSI is most disappointing of all, failing to deliver the excitement that a 200hp supermini should, but suffering some of the drawbacks we’ve come to expect, with harsher suspension (which can be deselected in the UK), steering corruption and wheelspin under heavier acceleration in lower gears. Performance isn’t the 40 TFSI’s only USP, however – it’s also the only model to come with the new S Line Competition trim. This includes 17-inch platinum grey alloys with matching door mirror housings, adaptive suspension and red brake calipers. What trim levels does the 2018 Audi A1 Sportback have? All other models are available in SE, Sport and S Line trim. 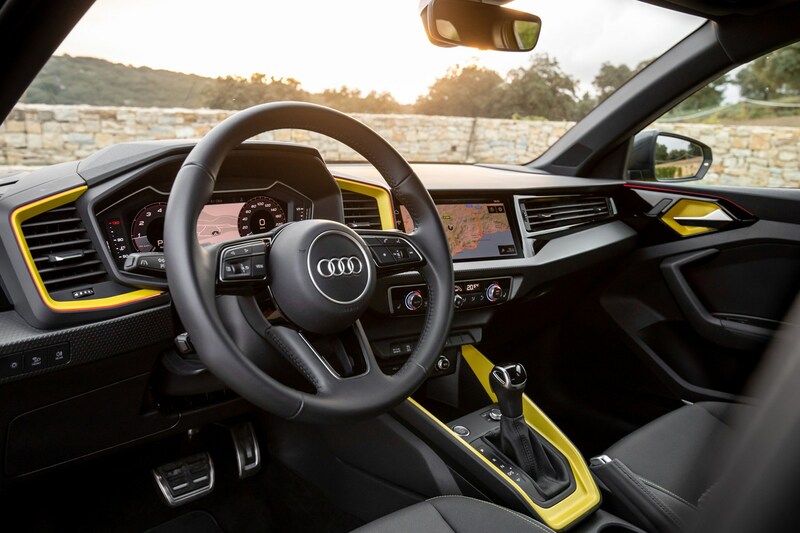 As well as the infotainment and instrument cluster mentioned earlier, standard equipment across the range includes a multi-function steering wheel, LED front and rear lights, DAB radio, smartphone interface, voice control, electric heated mirrors, plus lane-departure warning, and Audi pre-sense, with pedestrian/cyclist recognition. Sport upgrades from 15- to 16-inch alloys, cloth sports seats, cruise control and rear parking sensors. S Line introduces 17-inch alloys, sports suspension (which can be deleted), bodykit and half cloth/half leatherette trim. There are plenty of opportunities to personalise the Audi A1 Sportback, with some key equipment combined in attractive bundles. The S Line Style and S Line Contrast packages add upgrades including leather or Alcantara fake suede upholstery, unique alloy wheel finishes and darker exterior trim highlights. 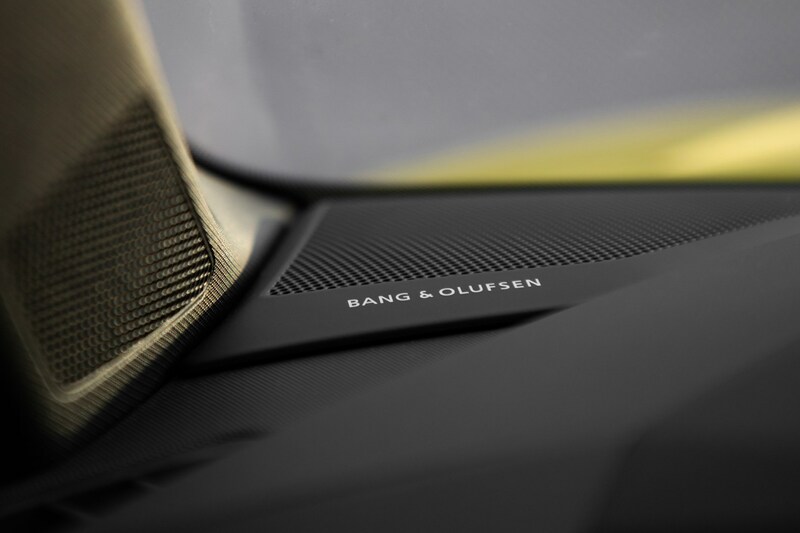 Buyers can also choose the Technology Pack (MMI Navigation Plus, Virtual Cockpit, wireless charging, and Audi Connect smartphone mirroring), and the Comfort and Sound Pack (Bang & Olufsen 11-speaker stereo, parking sensors/camera and heated front seats). 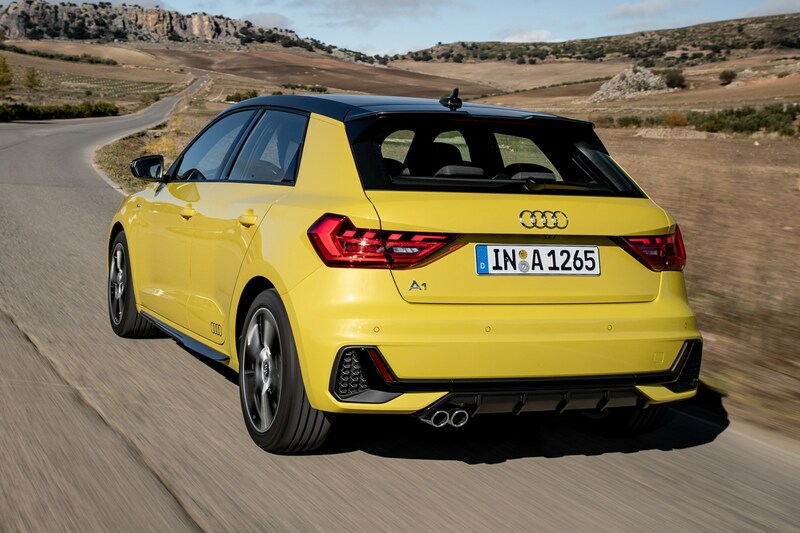 The Audi A1 Sportback has grown up in its second incarnation, with a more mature feel and some highly impressive infotainment. The larger bodyshell does have a more mainstream look than the cuter, more compact original, but it also results in a larger cabin and boot – it’s a supermini that can cover more bases than its predecessor, including family duties. This is an expensive choice compared with rivals, but the 30 TFSI is predicted to retain 45% of its value after three years/60,000 miles, which should help lower lease deals as well as providing those buying outright with more security. 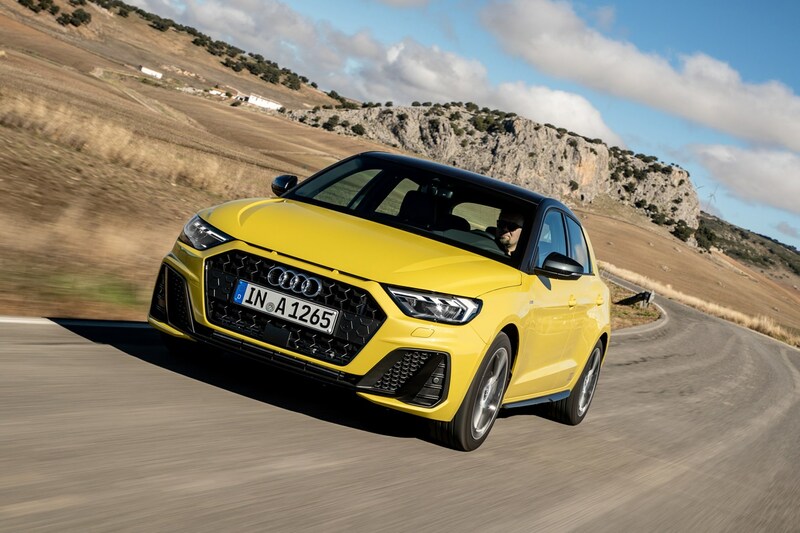 It’s easy to spend even more than the A1 Sportback’s already high base price, but our choice would be a three-cylinder 30 TFSI with a manual transmission and some nice options rather than a more powerful model with a lower spec.